Yesterday’s boredom-driven, internet-enabled trade scenario sent LeBron James to Golden State, Dwayne Wade to Denver and a bevy of young talent to Miami. It made fiscal sense, it made some basketball sense and it wasn’t the most offensive deal in the world to any party involved. In fact, two of the three teams improved significantly, and the other one might have gotten the second best deal on paper. That kind of magnanimity did not happen this time. Today I attempted to right Joe Dumars’ wrongs, restore luster to the Palace and bring an imaginary championship back to the D.
In order to accomplish this, I needed to run over any other imaginary team involved, crush them with the invisible hand of indignation and otherwise pillage and plunder any NBA roster with acquirable talent (which will have to involve Denver, just like any other huge trade would). No player is safe, no GM’s emotions, real-life tendencies or dignity is considered and very little attention is paid to whether or not this deal would ever happen. With all that being said, the money still works, everyone gets some sort of young, athletic balloon and the Pistons get much, much better. Like an estimated 14 wins better. And it could happen tomorrow. Why this, like, sorta works: Because… because… because… because the Pistons could use a break? And in this scenario they get to keep Twitter’s favorite player, Andre Drummond, while acquiring an ark’s worth of talent? Is that really my justification? Should I just keep asking questions to no one in particular to distract people from the absurdity of the deal? Does said deal work for the other teams? Absolutely not, but it doesn’t bankrupt them, and I would even argue that this deal actually serves the Pistons and the Rockets, in a weird sort of way. The Pistons immediately become better while shedding the last of the bad contracts. Their starting five becomes Jose Calderon, James Harden, Danilo Gallinari, Blake Griffin and Andre Drummond with Brandon Knight and Jason Maxiell coming off the bench. They can now play with any team in the East. Blake Griffin finally has a competent interior passer (Drummond) and a super competent wing. Miami wouldn’t be able to keep up with their starting five. Same for the Knicks. The Pistons would become favorites in the East again, Nelly would have the No. 1 song in America. 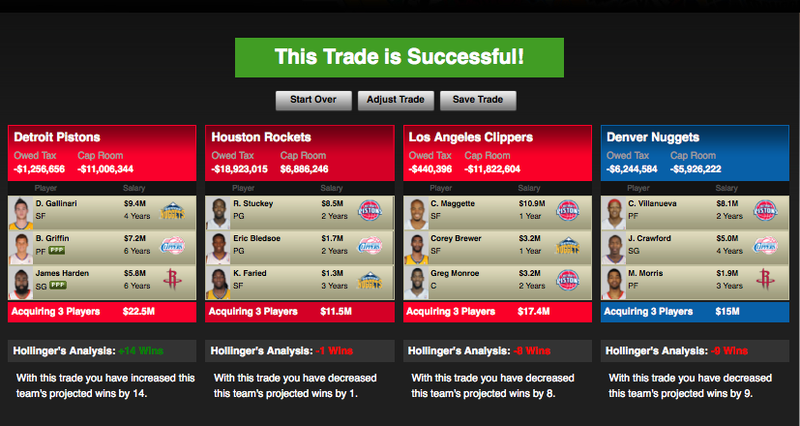 And the Rockets don’t totally lose in this deal (OK, they might. But at least it was a tough loss. The Clippers and the Nuggets got steamrolled in the equation). They lose their shiny new part (Harden), but they add two newer, potentially shinier pieces (Faried and Bledsoe) that make next to nothing for the next two years. 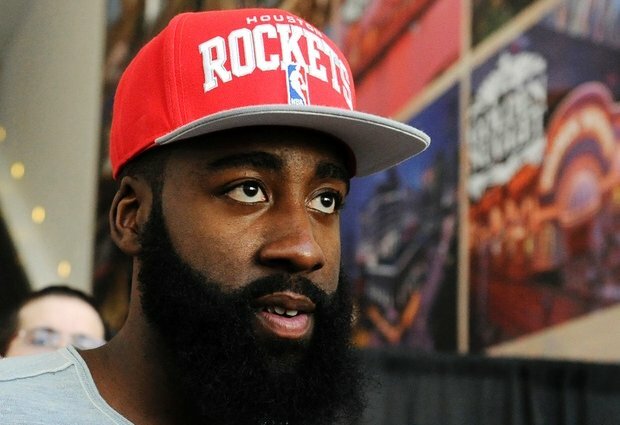 Stuckey can plug the immediate scoring hole that Harden would leave behind, and (in a world that justifies this ridiculous hypothetical and rewards this type of inane speculative behavior) Faried’s athleticism could provide the Rockets shooters with enough second chance opportunities to offset the inevitable decline in shot efficiency. The poor Clippers set themselves back a few years in this scenario, but they do get a bright young center (Monroe) and $15 million or so in expiring contracts. The real loser here is the Nuggets. Their house was stripped bare, the vandals leaving behind the garbage as some sort of messed up consolation. I have nothing against the Nuggets, mind you, and tomorrow I might try to turn them into a title contender, but today they got in the way of the mighty Joe Dumars. And nobody gets in the way of Dumars.